St. Francis of Assisi is quite possibly one of the most universally beloved saints, not only by Catholics, but by many Christians and non-Christians alike. Well-known for his dedication to serving God by embracing poverty, living simply, and treating all of God’s creation (from humans to animals to nature) with respect, St. Francis’ message is one that appeals to the yearnings of the human heart for true freedom and unfailing love. Born in 1181 in Assisi, Italy, to his mother, he was named Giovanni at his baptism, after St. John the Baptist. In 1182, his father, Pietro Bernardone, returned from a trip to France to discover his wife had given birth to a son. Furious that she had named him a Christian name, Giovanni’s father renamed his son “Francesco” (or Francis, in English), in honor of his own infatuation with France. Pietro was a wealthy cloth merchant, and wanted his son to grow up to be a successful businessman too. 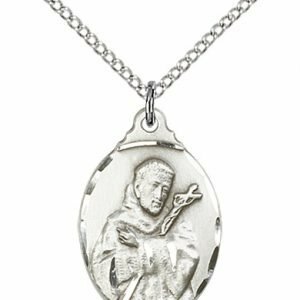 As a young boy, St. Francis was loved by everyone he met. His happy demeanor and wealth made for a very easy life. As his father had hoped, St. Francis became very interested in the songs, romance, and culture of France. When St. Francis became a bit older, he began to spend his time partying with crowds.Yet, St. Francis was yearning for more. He wanted the nobility of a knight. He had a suit of armor made and took off into the battle against Perugia. 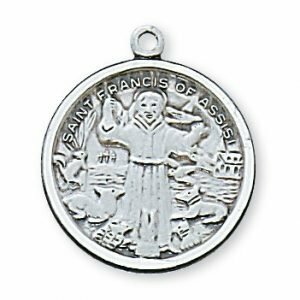 Because of his wealth, St. Francis was taken captive rather than killed, since his captors saw an opportunity for ransom. When St. Francis returned home, he began to party again, enjoying his life the way he previously had. 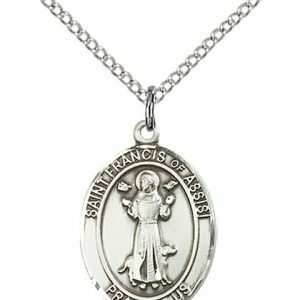 When another battle started up over the Fourth Crusade, St. Francis took off to fight in it, looking for the glory that he would achieve as a great warrior. St. Francis did not make it even one day’s ride away from Assisi when he had a dream from God that told him to return to Assisi because he had it all wrong. 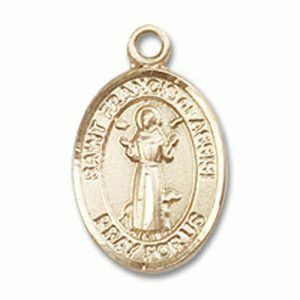 St. Francis turned around, and upon arriving home, was faced with humiliation and scorn for his foolishness in coming home so quickly. 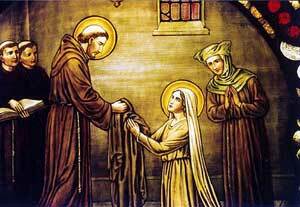 St. Francis took to helping his father with the cloth business, while also beginning to spend more time in prayer. He wept for his sins and God’s grace began to overwhelm him with joy. As his conversion was taking place, St. Francis went to the church of San Damiano, where he heard the voice of God telling him, “Francis, rebuild my church.” St. Francis assumed God was talking about the actual building, and became determined to restore the structure. It was not until years later that St. Francis would realize that God was referring to the need for conversion in the universal Church worldwide. At this time, though, St. Francis was concerned with fixing the crumbling church. He sold some of his father’s cloth to pay for building materials. When his father found out, he considered his actions theft, and reported him to the bishop. The bishop ordered that St. Francis repay his father, then told St. Francis that God would provide for what he needed. St. Francis, at that moment, took off his clothes and stated that Pietro Bernardone was no longer his father. He wanted nothing to do with the wealth and status of his family. He belonged to God alone. St. Francis began to travel through the land preaching to the people. His life was one of great respect for all of God’s creation – people, animals, nature – and he treated them as his own brothers and sisters, made by the hand of God. People were intrigued by his way of life, and soon some were interested in living the life of simplicity, poverty, and joy that they saw in him. St. Francis sent these people out to preach, also, sharing with everyone the message of God’s love and mercy. 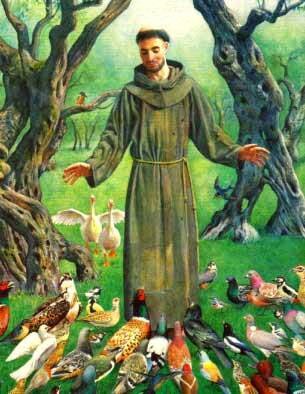 St. Francis is said to have preached to animals, too, that would stay and listen until he had finished. 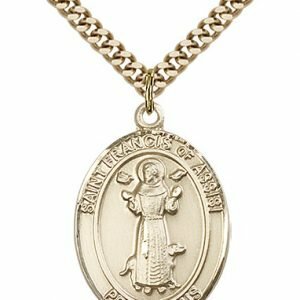 One person who was particularly moved by the example of St. Francis was a woman who would do just what St. Francis had – leave her family and the life she had known to live a life of poverty dedicated to God and His people. This woman was, of course, St. Clare of Assisi, the foundress of the Poor Clare nuns. 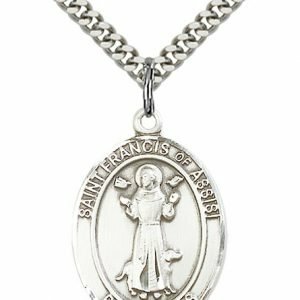 St. Francis believed the key to true joy was absolute poverty – if there was nothing holding him back from God, then he was completely free to live for Him and love Him totally. When St. Francis visited Pope Innocent III, he was turned away due to the rags he was wearing. The pope must have that that certainly this man could not be serious! But when Pope Innocent III had a dream of St. Francis holding up one side of St. John Lateran Basilica, he called to have St. Francis brought back to him and gave him permission to preach. In the dream, the man holding up the other side of the church was St. Dominic, who was a contemporary of St. Francis and would go on to found the Dominican Order. St. Francis continued to live his life in poverty. His attitude toward poverty was not that it was a disgrace or curse, but that it was a blessing that led to the ability to trust in God alone. As the community of people devoted to living the lifestyle of St. Francis increased, a leader was appointed, and St. Francis was able to live the simple life of a brother within the order that was beginning to form. The years of poverty and walking about preaching began to wear on St. Francis and he grew ill. 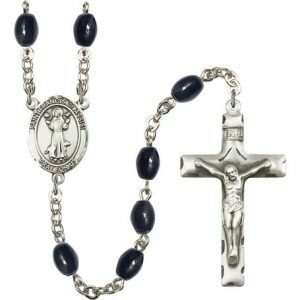 He prayed to share in the sufferings of Christ, and received the stigmata – the wounds Christ bore in his hands and feet from the nails, as well as the lance in his side – which St. Francis lived with the rest of his life. He also began to go blind. In the midst of this pain and sickness, he wrote the Canticle of the Sun – a prayer of praise to God for His creation. 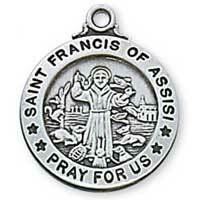 St. Francis died on October 4, 1226, at the age of 54. 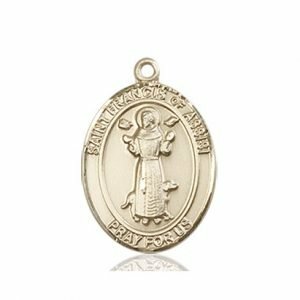 Since his death many Franciscan orders have formed, determined to live the example of poverty and simplicity that St. Francis showed many years ago. 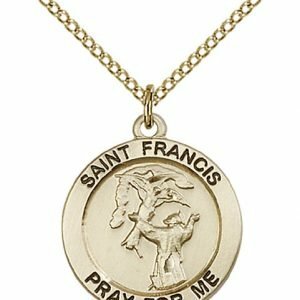 St. Francis’ feast day is October 4. 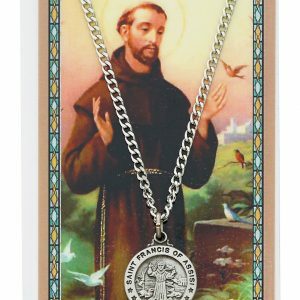 St. Francis is the patron saint of animals, the environment, and merchants. In artwork, St. Francis is usually pictured wearing the brown robes, often with patches, symbolizing his life of poverty. Many times he is accompanied by animals, particularly birds and a wolf, recalling events in his life. He is said to have preached to the birds while they sat and listened until he dismissed them to fly away. The story of the wolf is one of a town that was being terrorized by a wolf who would attack and kill the townspeople. 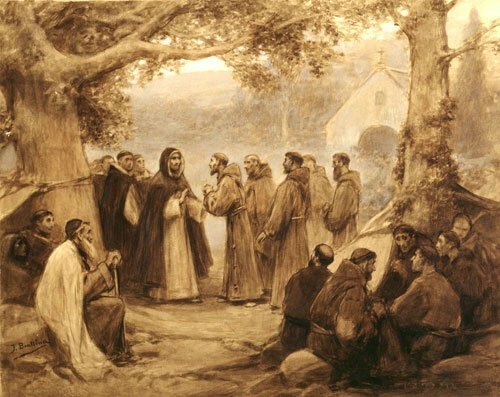 Instead of advocating killing the wolf, St. Francis made a deal with the wolf that as long as the people fed him, he would be kind to them. He became a sort of town pet from that moment on, and never hurt the people again. 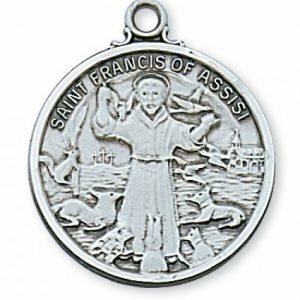 Much like his portrayal in other artwork, you are likely to see St. Francis in a simple robe in the company of animals on a St. Francis of Assisi Medal. Let Saint Francis of Assisi be your partner in prayer as you say one of the prayers below or as part of your rosary devotion. Find Saint Francis of Assisi Rosary Beads here. by Your holy Cross You have redeemed the world. Amen. he may pardon our sins. our Lord and Master, Amen. great love for each of Your creatures.